World Book Day is something I've been aware of over the last few years but this is Bud's first year taking part in the celebrations, at nursery school. I'm all in favour of children's books getting the chance to shine although I'm very relieved that Bud's nursery is just asking the children to bring in their favourite book from home, rather than dressing up. Miles Kelly got in touch to ask if we would like to take part in a secret World Book Day gift swap. We would be sent the details of another blogger and have to choose a book for their children from the extensive Miles Kelly range. In turn, someone else would choose a book for Bud and Little Miss. I'm a huge fan of Secret Santa swaps so I had to say yes. I was sent the details for The Yewman Projects, which was a new blog to me, so I quickly got snooping and eventually decided on Awesome Space. It was a tricky decision but I saw mention of space a few times on Sarah's blog and took a punt. Hopefully it will be a successful choice! 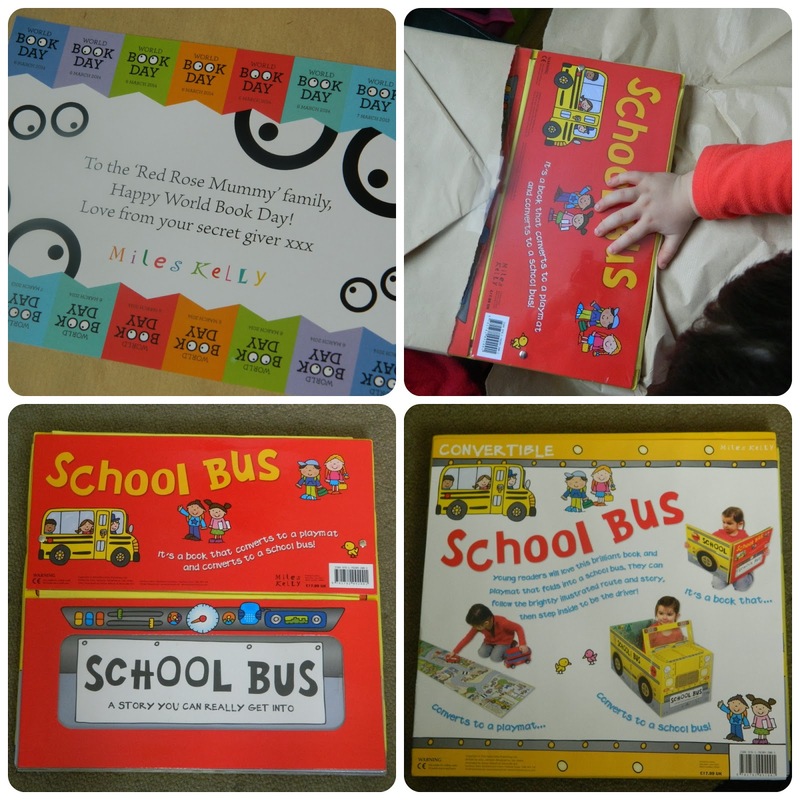 While browsing the Miles Kelly site choosing the book I wanted to give, I couldn't help but spot the amazing books which fold out into play mats and vehicles and I secretly had my fingers crossed that our sender might choose one from that range. Our beautifully wrapped parcel was a very exciting arrival with Bud asking if it was for him and his Sister. When we unwrapped it we were delighted to see the School Bus fold out book. This was a great choice for a family with a boy and a girl and is a really innovative cross between a book and a toy. 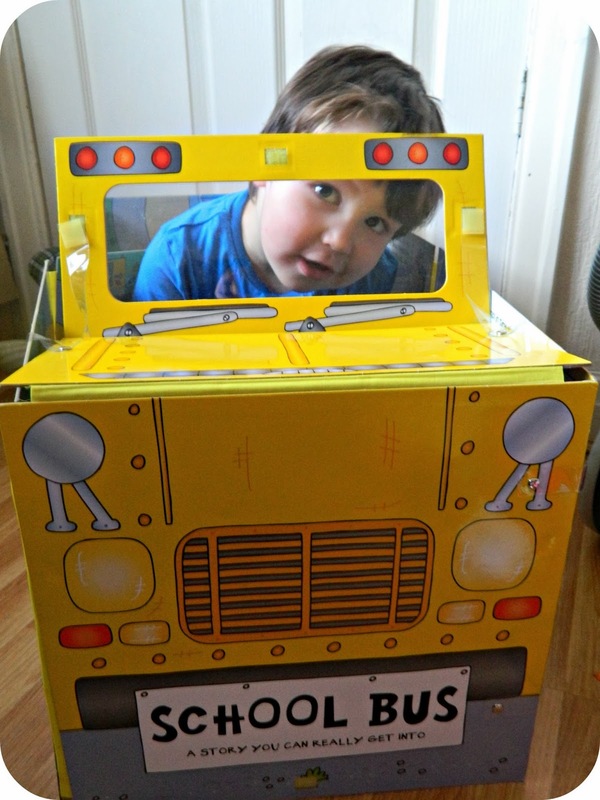 You can fold it out into a play mat, or assemble it into a simple bus shape. This is done by using plastic strips with velcro attached which, when I first saw them, looked like they wouldn't hold it but, I'm pleased to say that they did and it keeps the standing shape really well. The text and illustrations are bright, colourful and engaging, whether reading or playing. As soon as Bud saw it assembled he wanted to climb in and was packing the bus for his 'journey', it's been played with a lot since. One of the best things is that you don't need to fold the book a certain way as it has fabric strips which connect the pieces. We had an accident with our bus which saw one of the fabric strips get damaged. I thought it would be really broken but it is a simple repair job, thank goodness! The School Bus was the perfect choice for us, thanks to whoever chose it, and to Miles Kelly for asking us to participate in this fun project. Disclaimer: We were sent a book and chose one for another family with Miles Kelly.